The far-right former Congressman Mike Pompeo was opposed by Human Right Watch. On Monday night, former Congressman Mike Pompeo was sworn in as the Trump administration's CIA director by Vice President Mike Pence, after being voted in by members of the senate including fourteen Democrats and their leader, Chuck Schumer. Human Rights Watch opposed Pompeo's nomination, "due to overriding concerns that he would use the agency’s surveillance and other powers in ways likely to violate rights on a broad scale," the organization said in a statement. Pompeo has a troubling history as an advocate of surveillance and torture. In a 2016 opinion article for the Wall Street Journal, he urged Congress to pass a law that re-permitted the NSA to collect metadata and combine it with "publicly available financial and lifestyle information into a comprehensive, searchable database.” Pompeo did not indicate during his confirmation hearing that he had changed his position. He has advocated "enhanced interrogation techniques" like waterboarding, and though Pompeo acknowledged their illegality during his confirmation hearing, he also indicated that the CIA may restore such practices under his leadership. Pompeo has called for Edward Snowden to be executed, but the NSA whistleblower is far from the CIA director's only perceived enemy of the state. As The Intercept notes, Pompeo frequently appeared as guest on anti-Muslim radio host Frank Gaffney's program, where he claimed (falsely) that Islamic leaders do not speak out against terrorism and are therefore complicit. It's likely that at least some Democrats voted for Pompeo out of fear of appearing "weak on terrorism." Before the vote, Texas Republican and Senate Majority Whip John Cornyn issued a dire warning of the "incredible threats" faced by the United States, according to CNN. "The President needs his national security Cabinet, and particularly his CIA Director at his side, a Cabinet position integral to keeping our country safe." 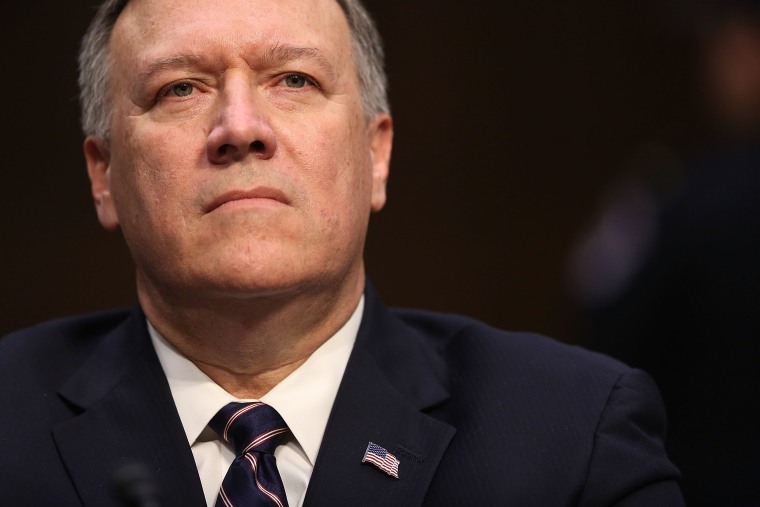 The Democrats who cast their vote for Pompeo are: John Donnelly of Indiana, Dianne Feinstein of California, Maggie Hassan of New Hampshire, Heidi Heitkamp of North Dakota, Tim Kaine of Virginia, Amy Klobuchar of Minnesota, Joe Manchin of West Virginia, Claire McCaskill of Missouri, Jack Reed of Rhode Island, Brian Schatz of Hawaii, Schumer, Jeanne Shaheen of New Hampshire, Warner, Sheldon Whitehouse of Rhode Island, and Angus King, an independent from Maine who caucuses with the Democrats.